Angelfish is very territorial and as such they require large tank size measuring at least 50 gallons and above if you plan to keep 2 to 4 angelfish. They can grow up to six inches in height and because of their aggressive behavior and incompatible nature with other fish, angelfish should only be kept with its own species. Most aquarist have tried keeping them in large community aquarium but ended up with little success as they will wreck havoc by attacking other smaller species and consuming young fish fry. This is even more evident especially during spawning period. If properly fed and cared for, angelfish can grow very fast and it will take about a year and a half to reach full-grown size. The growth rate is largely contributed by different factors such as quality of food (whether they have good mix of nutritious dried flakes and live foods), temperature and space availability. Compared to their cousins in the freshwater tropical areas in the wild Amazon jungles, Angelfish in home aquarium can tolerate wider range of water parameters with temperature ranging from 25 to 29deg Celsius and with pH between 6.3 to 7.0. However, when it comes to water cleanliness, it is very important to maintain perfect water condition because they are very susceptible to contacting ich or white spot disease. An angelfish tank setup should have an aquarium heater for temperature control and good filter to maintain perfect water quality. I would recommend putting live plants especially those with big leaves such as sword plants for easy maintenance. However before you introduce anything into your angelfish tank, make sure it is properly rinsed and cleaned or else you will risk introducing pesky snails. Plants also help to maintain better water quality and it also helps to ensure that the fish will acclimatize faster in newly setup fish tanks. In fact, their needs are almost quite similar to that of discus fish, which you can read up further in details in order to better understand about all the Amazonian species. When it comes to breeding angelfish, it can be quite tricky because if you don’t have an active breeding pair, they will not spawn. Most of the time, if you are raising 2 to 3 angelfish in a tank, you could somehow ended up with all with the same gender or sometimes they will never pair up due to compatibility. Once you have a successful breeding pair, it is a good idea to separate out the rest either by putting into other separate fish tanks or giving away for adoption. If not, the breeding pair will become aggressive and attack the other fish especially during spawning period. In order to stimulate spawning, you can perform a partial water change in order to shift the water temperature range to become 2 to 3 degrees higher than normal. 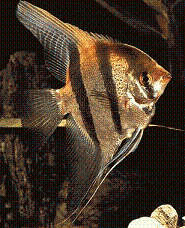 Different groups of angelfish can also refer to saltwater angelfish of the family Pomacanthidae.